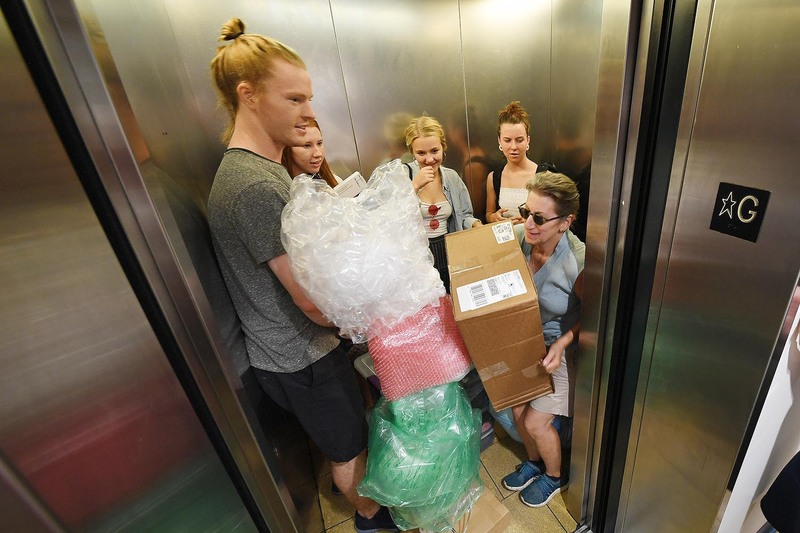 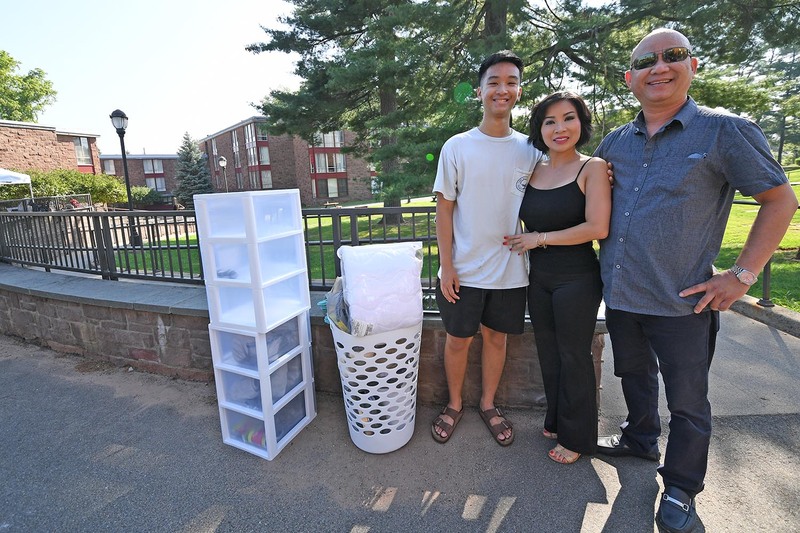 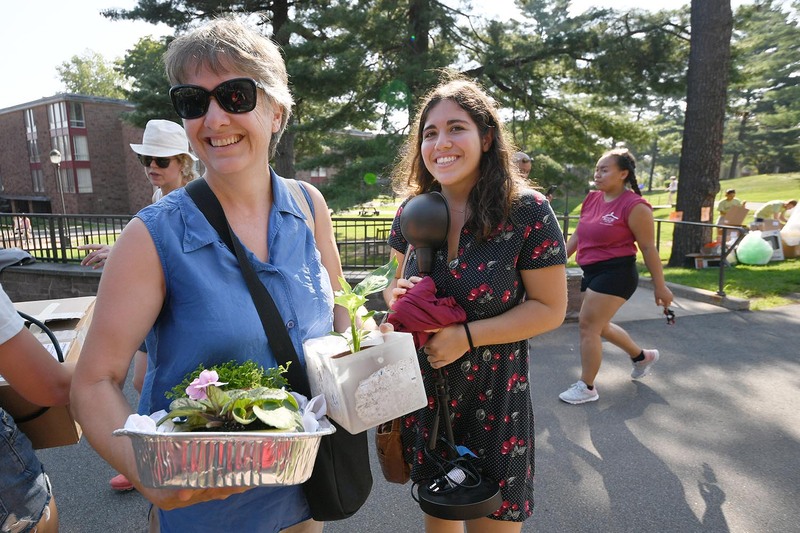 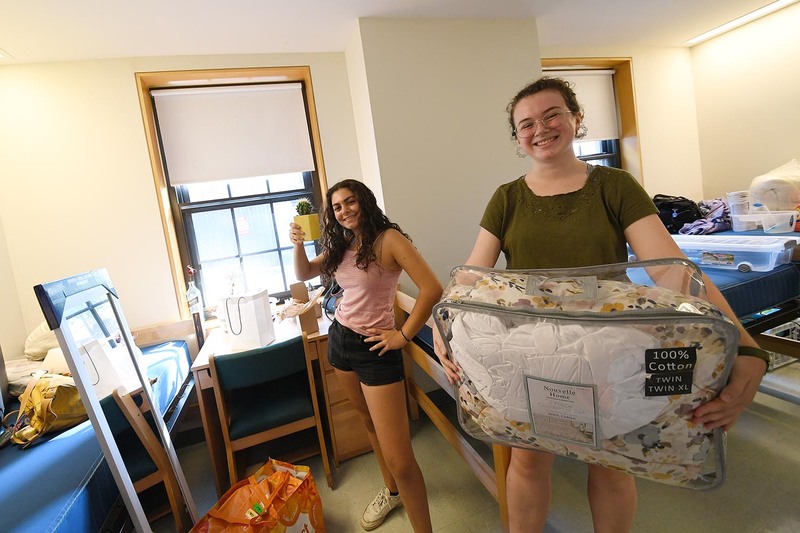 On Aug. 29, in temperatures hovering around 90 degrees, 810 new students from the Class of 2022 moved into their new residence halls on New Student Arrival Day. 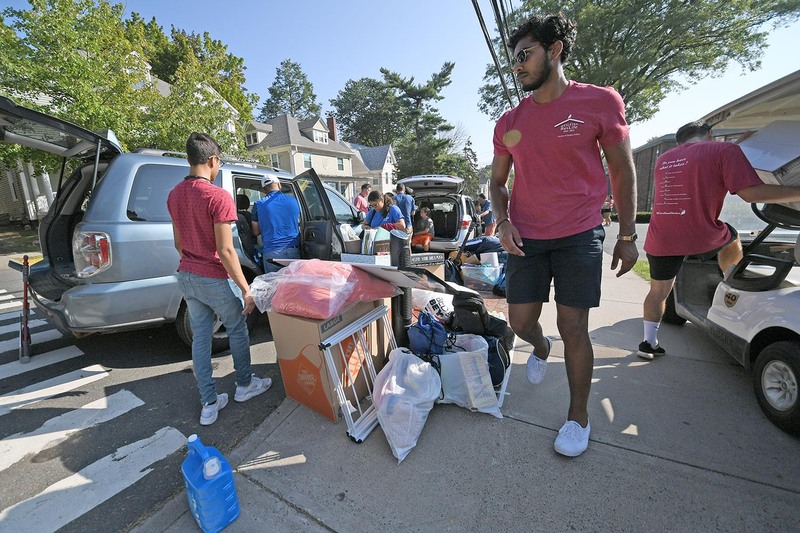 Wesleyan received a record-breaking 12,788 applications for a spot in the Class of 2022, of which 2,219 were admitted. 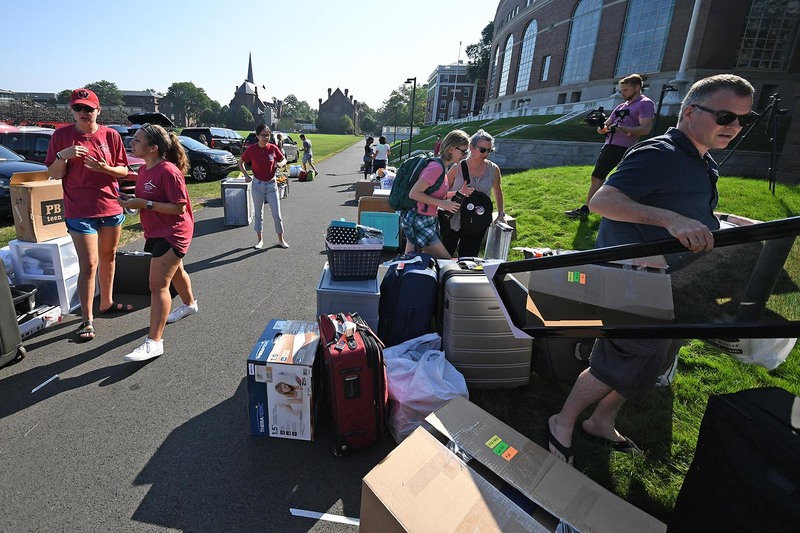 Of those, 810 matriculated and another 44 students transferred into Wesleyan. 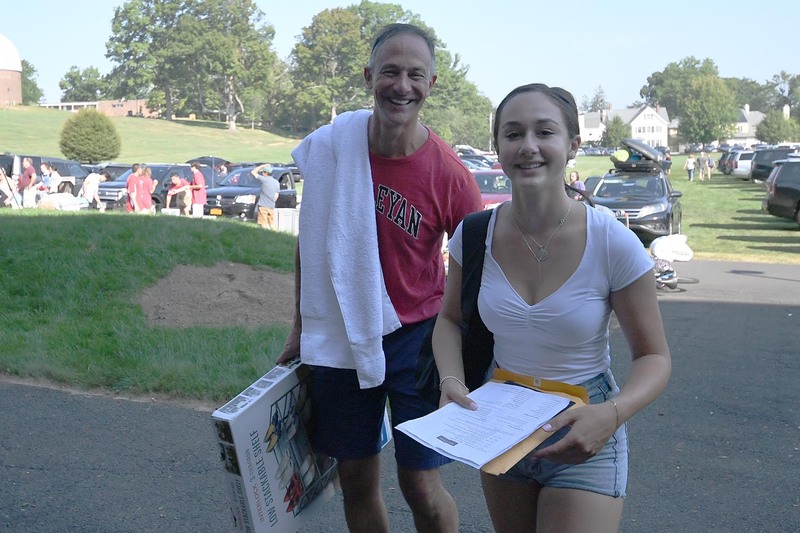 Wesleyan President Michael Roth ’78 helps a student move into her residence in the Butterfields. 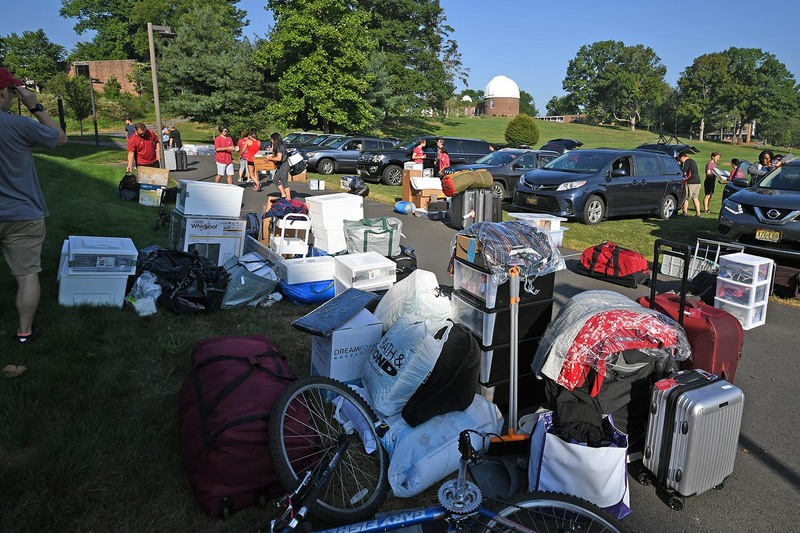 Several Wesleyan staff, residential advisors, and student-athletes assisted the new students with their belongings. 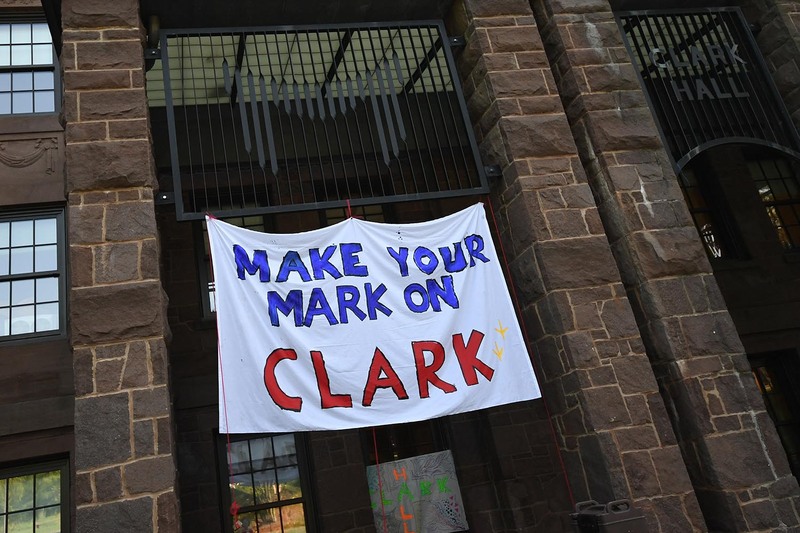 After settling into their home-away-from-home and saying farewell to their families, the new students participated in an array of New Student Orientation social activities involving group sessions with orientation leaders, academic forums, autobiographical monologues written and presented by current students, a neon space party, a student of color luncheon, an a capella concert, a pride reception, stargazing, karaoke, and more. 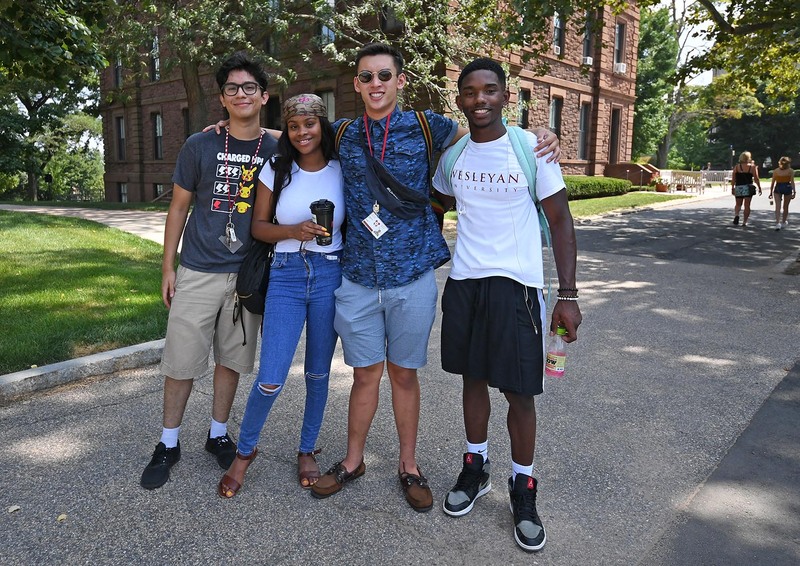 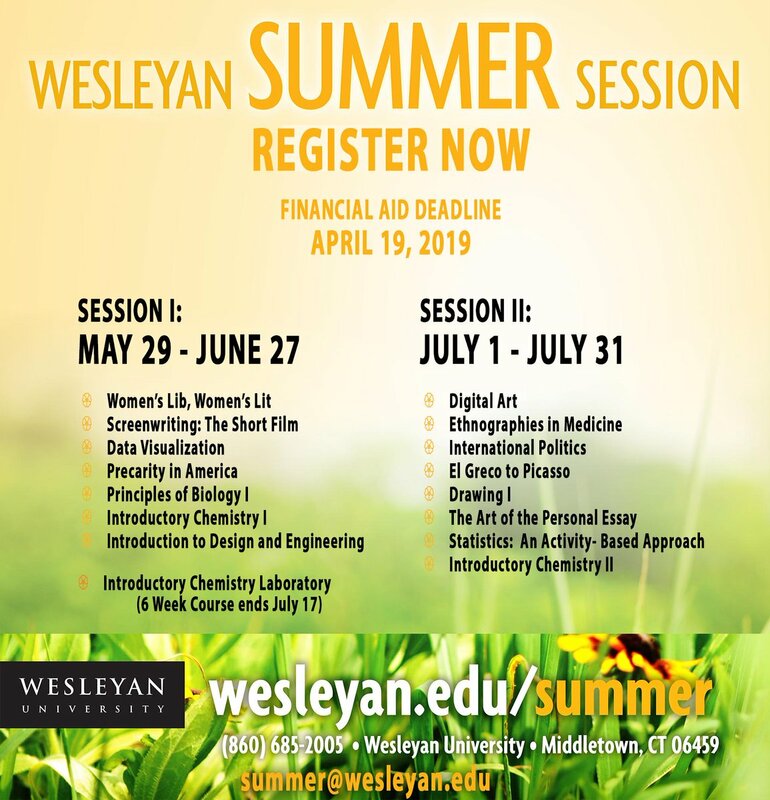 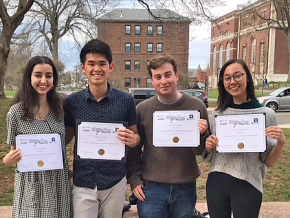 The students also were introduced to the First Year Matters program, which provides a shared experience for the entire class as well as an introduction to intellectual life at Wesleyan. 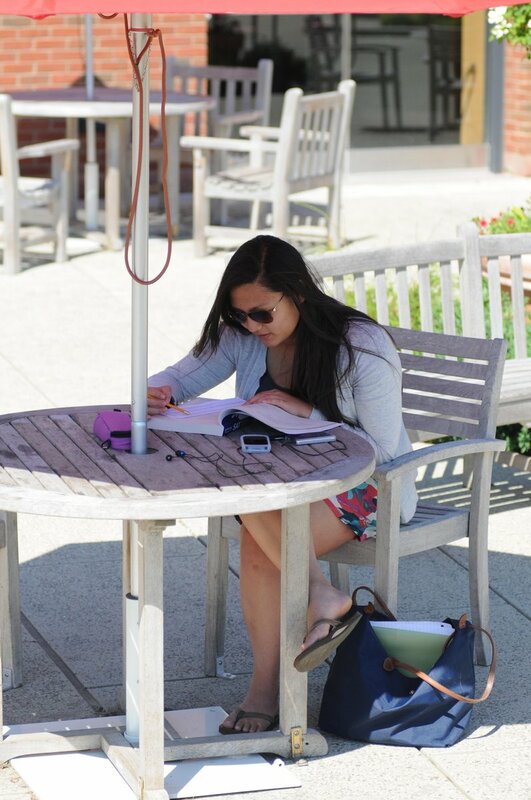 This year, the students will collectively read A Body Undone, by Christina Crosby, professor of English, professor of feminist, gender, and sexuality studies. 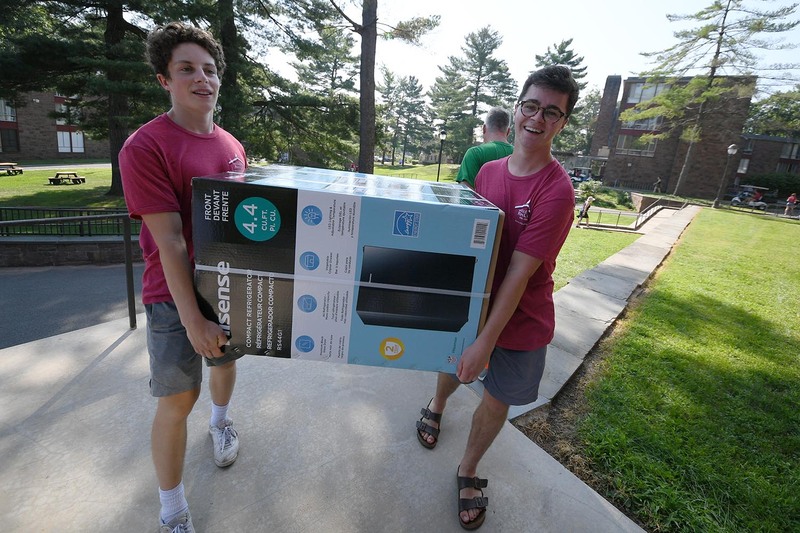 Orientation concluded with the Common Moment, where members of the incoming class are brought together through music and performance. 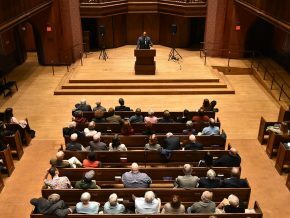 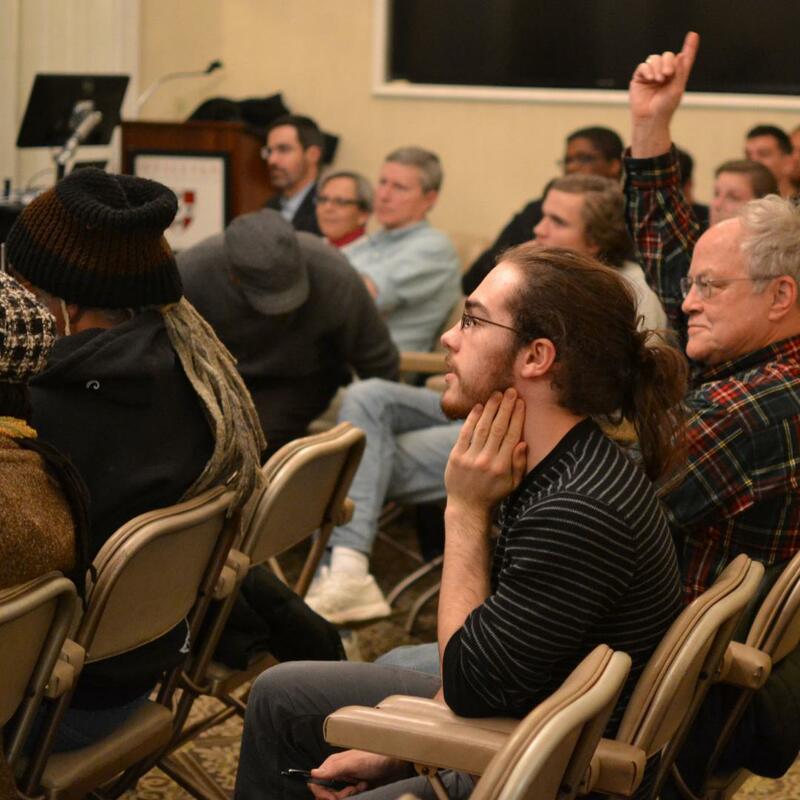 “A good liberal education empowers you to figure out what you love to do, learn how to do it better, and then how to share that talent with the rest of the world,” said Wesleyan President Michael Roth during a gathering with the first-year students and their families. 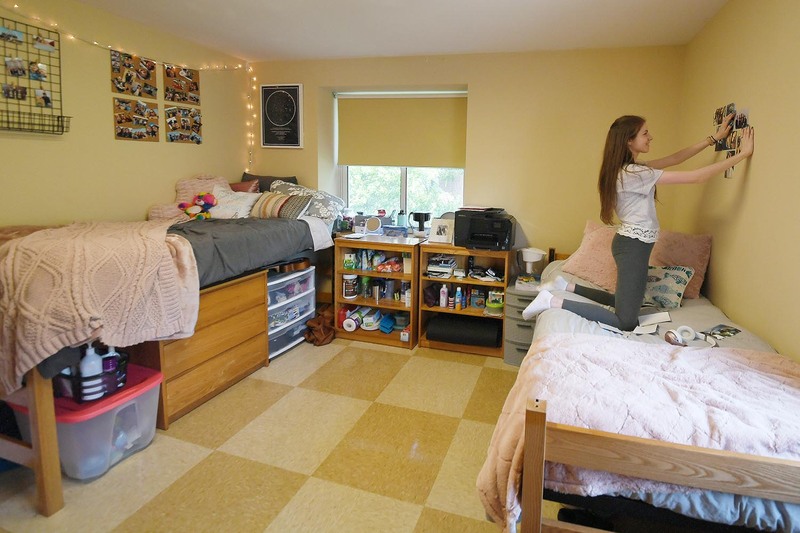 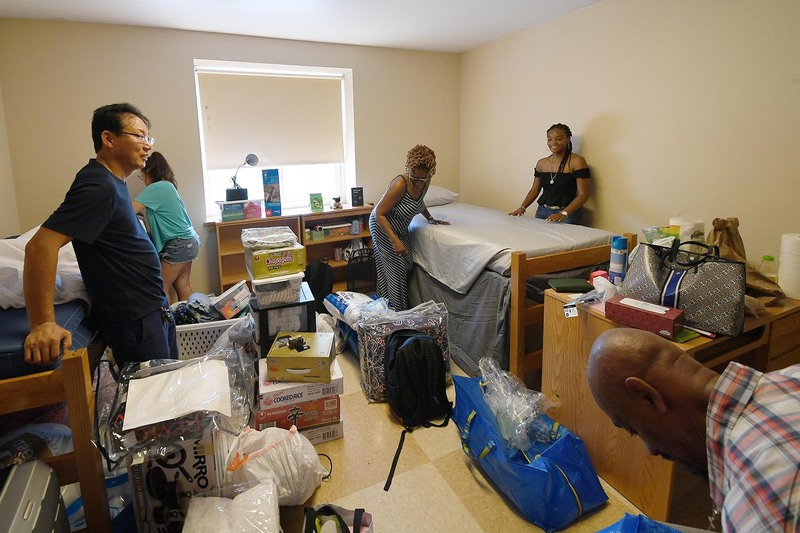 Cambria Weaver ’22 from Santa Barbara, Calif., sets up her room in the Butterfields. 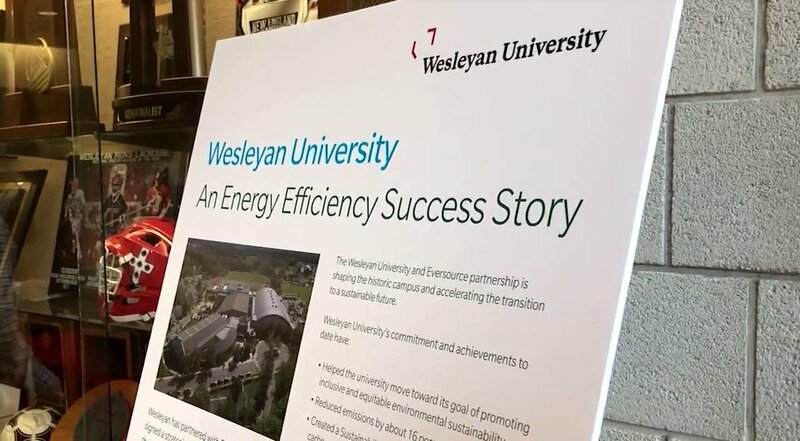 Weaver learned about Wesleyan from alumni. 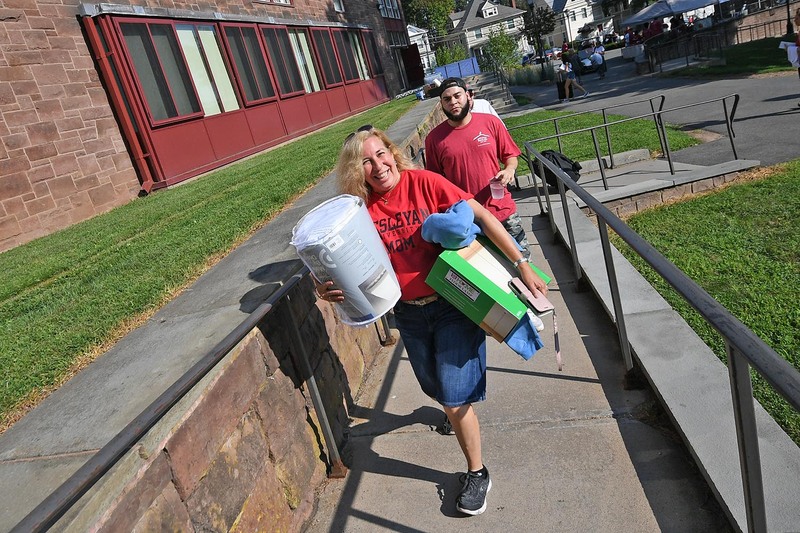 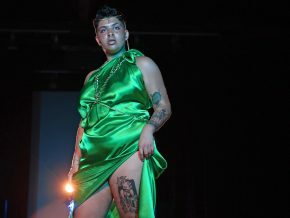 “All were into different things and they were each very passionate about what they were doing,” she said. 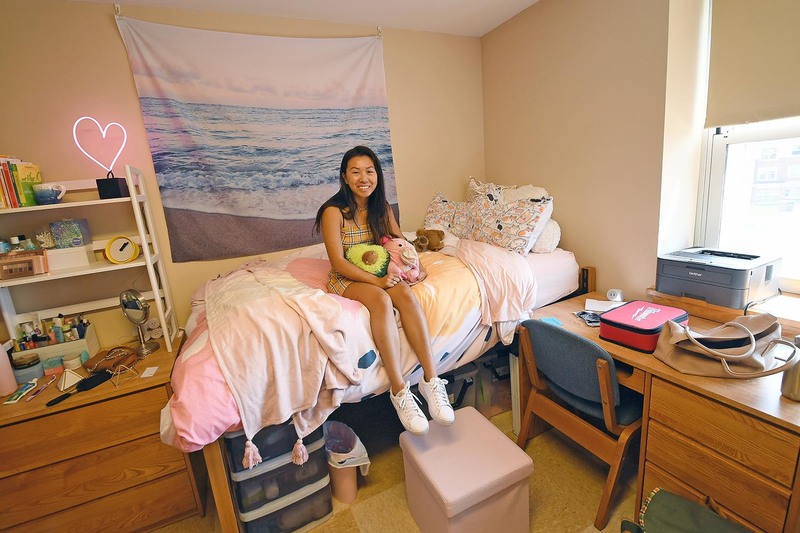 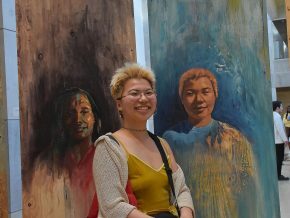 Gina Gwiazda ’22 from Santa Cruz, Calif. came to Wesleyan seeking a supportive community and open curriculum. 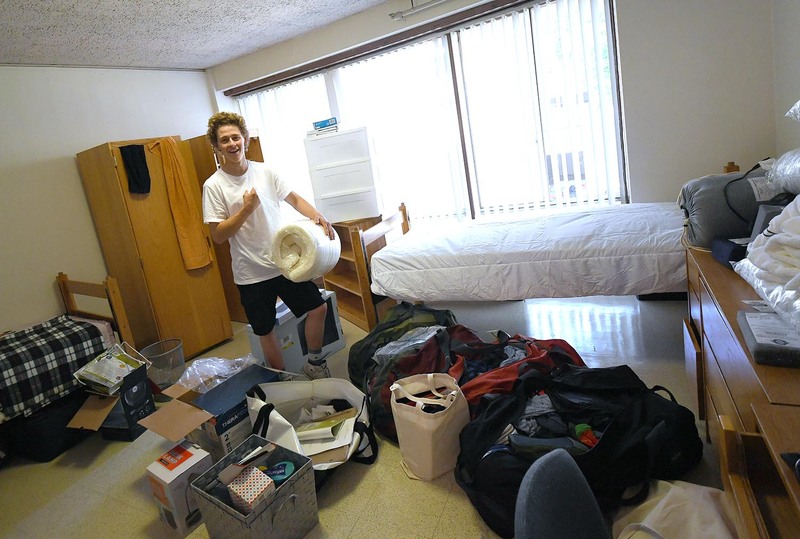 Gwiazda and Weaver are roommates. 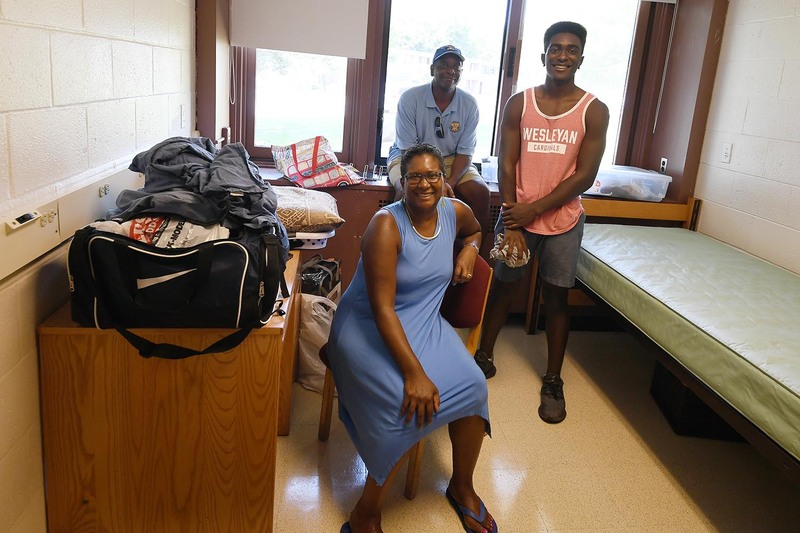 Dewellyn Howard ’22, with his mother Sabrina Spencer, made the trek up from Lafayette, La., along with Dewellyn’s father, grandmother, and sister. 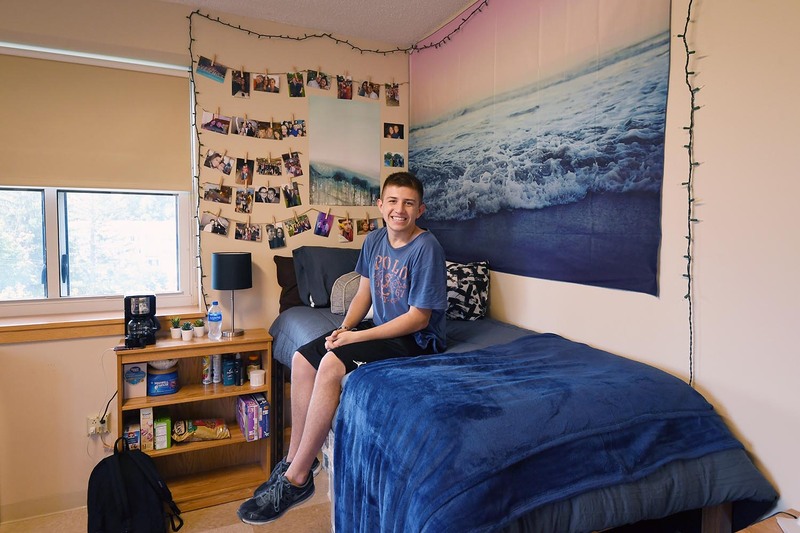 Howard chose Wesleyan for the warm community vibe he felt when he visited. 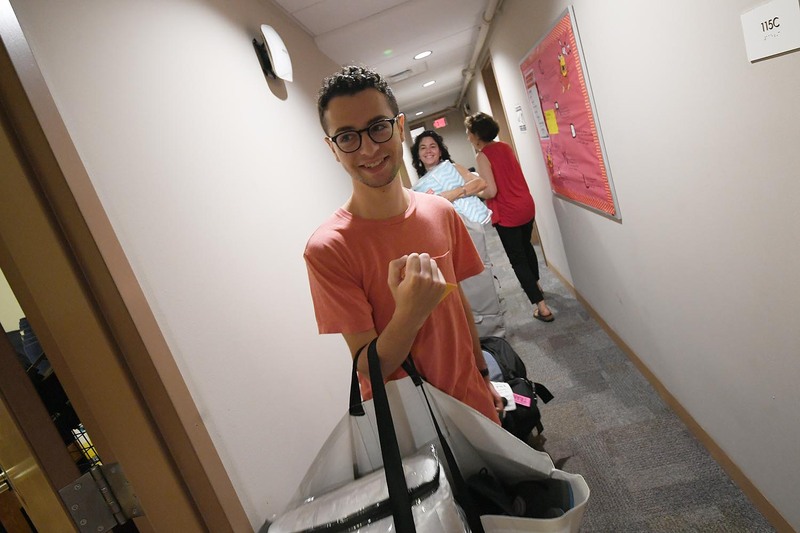 “Everybody I met just welcomed me, like we’re all family here.” A prospective math major, he was also eager to explore the COE Think Tank. 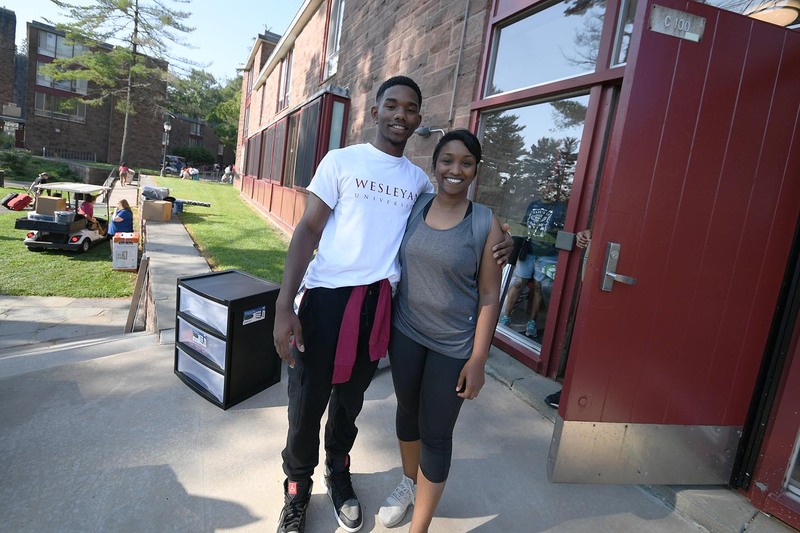 Other assets that that drew him here: Wesleyan’s libraries, as well as the surrounding community (“not a big city, but not out in the middle of nowhere”) and the fact that his best friend was just down the road at Yale. 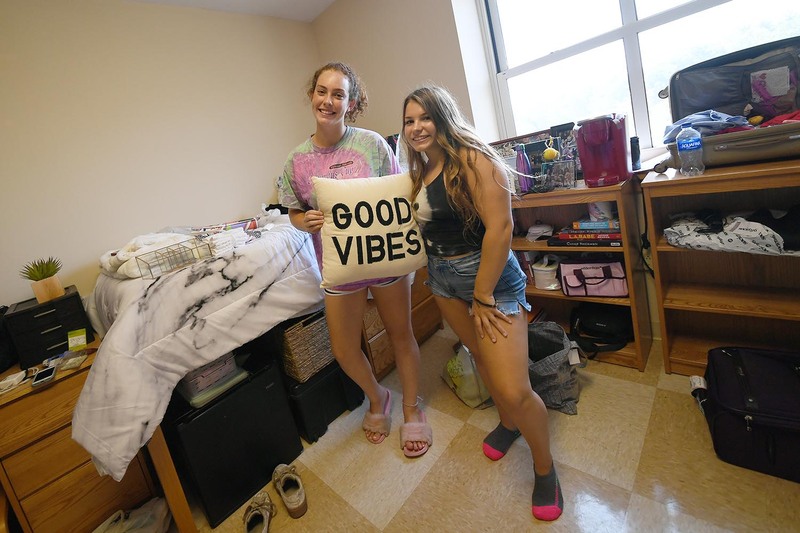 Layla Krantz ’22, from New York City, and Sarah Bazarian ’22, from Dracut, Mass., set up their room in Clark Hall. 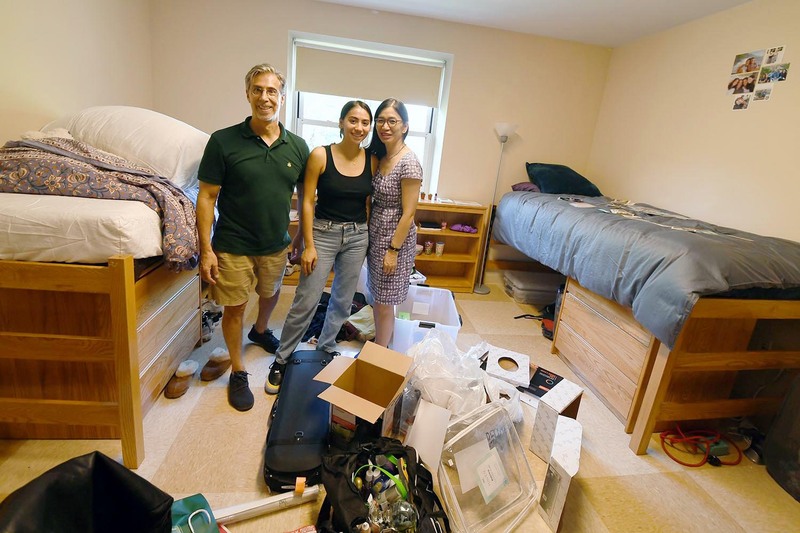 “I liked everything about Wesleyan,” says Bazarian, who is contemplating a major in either English or government and waiting to talk to her advisor about some potential changes in her schedule. 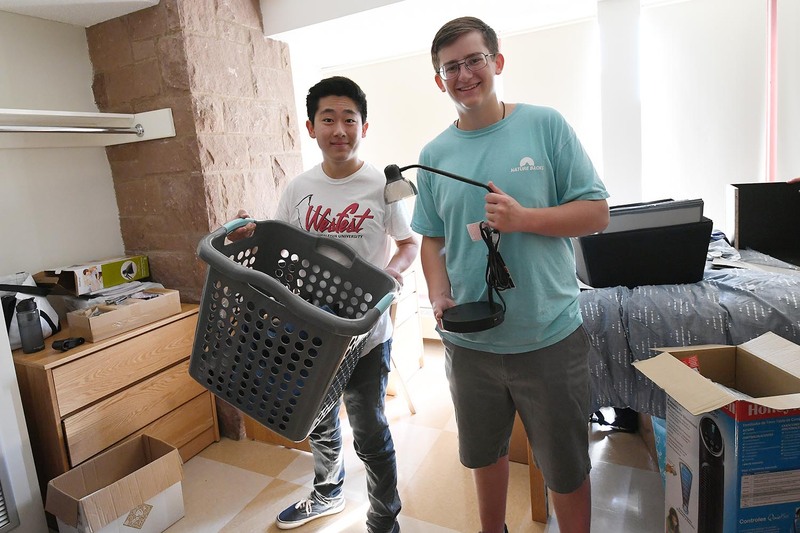 Theo Li ’22, from Elgin Ill., is considering a major in biology; Adam Kielbasa ’22, from Griffith, Ind., says psychology might be his focus.